In the age of social media -- when how food looks matters just as much as how it tastes -- luxury fashion stores that house coffee shops and restaurants have emerged as hot spots for fashion-conscious foodies. Instagram is flooded with pictures of food, including many taken in the sophisticated settings of in-house dessert cafes and restaurants at luxury fashion flagship stores in Seoul such as Dior and Hermes and some hip multi-brand stores like Boon the Shop and 10 Corso Como. 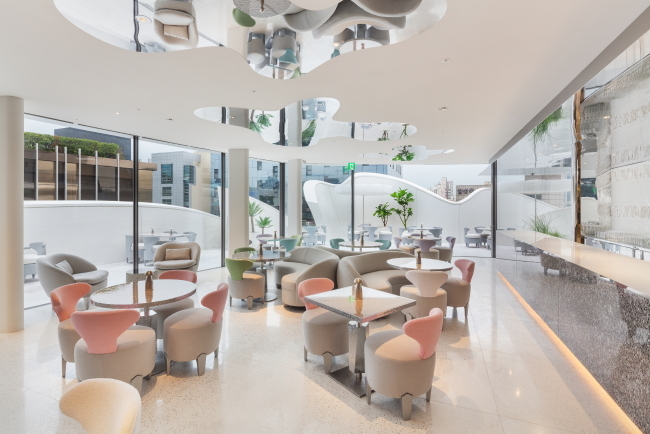 The Cafe Dior by Pierre Hermes, located on the top floor of Christian Dior’s flagship store in the affluent district of Cheongdam-dong, Seoul, has become a haven for selfie lovers and shoppers since it opened in May last year. Just a couple of month after its opening, it became one of the must-visit tourist spots in the capital city for fashion-savvy tourists from Asian countries. A popular Chinese fashion blogger posted photos of Cafe Dior on Instagram last year, putting the white tulip facade building on the itineraries of many tourists, according to a wait staff at the cafe. On a recent visit, Japanese tourists dressed in Dior dresses and carrying elegant Lady Dior bags were spotted having dessert at Cafe Dior and taking photos in front of the elegant building designed by French architect Christian de Portzamparc. 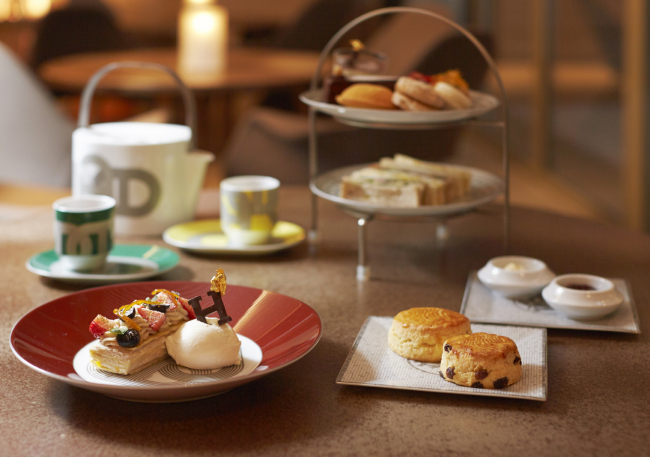 Dior joined hands with celebrated French pastry chef Pierre Herme to offer more than 20 kinds of dessert at the cafe. Desserts cost from 24,000 won ($17.60) for a vanilla millefeuille to 55,000 won for Sensation Chloe, a dessert set for two persons. While the prices are not easy on the pocket, this does not seem to deter sweet-toothed female customers who come in to savor the cafe’s popular Ispahan macaron and cake with a complex flavor of lychee, rose and raspberry. Dior’s rival in culinary offerings is Cafe Madang at the basement of Maison Hermes Dosan Park in Sinsa-dong, Seoul. 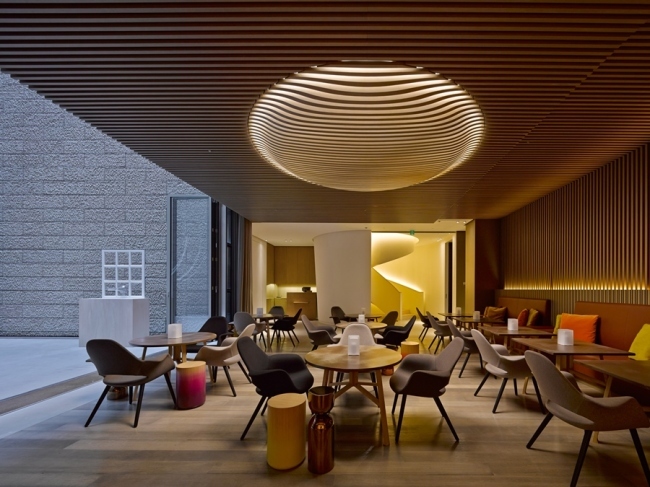 The cafe, which opened in 2006 when the Hermes flagship store opened its doors, was refurbished in 2014 to reflect Hermes’ major design motifs such as elegant leather surfaces and color patterns. It is presenting a new menu in May, prepared by chefs from Shilla Hotel, which jointly runs the restaurant. All dishes, ranging from light salads to filling main dishes and desserts, are served on Hermes tableware, featuring Hermes’ signature Chaine D’Ancre pattern, based on the Hermes bracelet created in 1938. 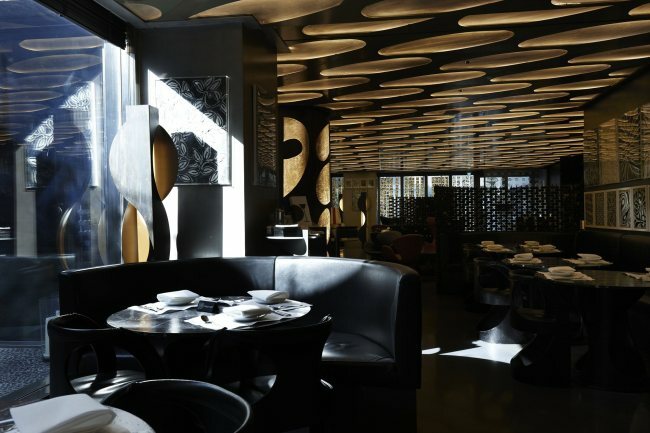 In-house cafes and restaurants draw customers who may not be able to afford clothes and accessories at luxury brand stores, but who still want to enjoy the sophistication of the brands, said Song Bo-rah, senior fashion news editor at Vogue Korea magazine. “It has became important for luxury brands to present the lifestyle that their customers, who hold their bags or wear their clothes, want to pursue,” said Song. Multi-brand store Boon the Shop offers high-end fashion and accessory brands as well as an upscale dining experience at the Japanese restaurant Kojima and the cafe-restaurant Rubrica. Kojima, run by a leading sushi master in Korea, boasts some of the best sushi in Seoul, attracting sushi connoisseurs in the country. “Having a branch of a popular restaurant or a cafe that serves good coffee is a factor that draws potential shoppers to the store,” said Song. Rubrica Cafe, located at the end of the shopping route in Boon the Shop, serves as the resting spot where shoppers can take a break. 10 Corso Como Cafe in the multi-brand store with the same name in Cheongdam-dong has long been a friendly, yet hip place to eat and shop since 2008. It offers Italian-Korean fusion dishes and dessert menus. The cafe also became popular after it was featured in Psy’s “Gentleman” music video in 2013.